2. Big Bore Shock System with screw adjustments. 3. Full Ball Bearing thought out the car. 5. Slip differential for Center. 7. Front & Rear Toe in adjustable system. 8. Racing Hinge Pin for front and Rear. 11. Full Hex Racing quality Screw. 12. Alum Hex Wheel adaptor. 13. Alum Shock body and Cap. 14. Fully upgradable to 90% alum parts. 15. Spring Servo Safer System. 16. Low Profile Preprinted Body. 17. Low Balance CG design. 18. Fully High Quality racing Drive shaft. 23. High Quality Racing 1800 NIMH battery. Caster Racing have released the following information regarding their all new EP 10th scale buggy, the SK-10. Caster Racing is proud to announce the release of a new 1/10th 4WD off road buggy. They started off with a high level competition RTR chassis design foundation. The SK-10 Buggy is a EP buggy that got all the racing features, and performance that a competition car needed. 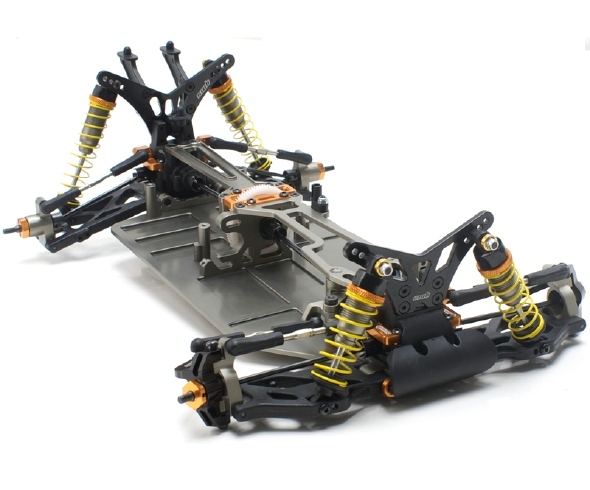 It's an 100% upgradable chassis to a higher level competition parts and features. SK-10 comes with the most advance performance design such as Mini Big Bore shocks with 3.5mm shock shaft. Slip clutch differential in the centre, those are only available and build in the competition kits, but we have put all those racing features into SK-10 buggy which makes the buggy one of the kind in the market, and amount others. We have raise up the entry level bar. The advantage of having such a buggy, it's totally 100% race competitive with other racing kits in the market for the fair price you have paid. In other words, the C/P(Cost/Performance) rate is much higher than other kits out there in the market. Elle a plutôt une bonne tête. Si j'ai bien compris ce serait une voiture entre loisir et compét. étant donné qu'une électronique y serait déjà intégrée !? C'est dans cet esprit, en fait c'est du RTR (Ready to Run), donc du prêt à roulé, mais avec toutes les composantes châssis pour pouvoir rouler en compétition et ainsi rivaliser avec les autres chassis! C'est un bon rapport prix/performance ! J'espère avoir plus de photos du châssis! Caster/OCM est plutot connu en 8e TT pour faire des (mauvaises) copies (cassantes) de Mugen MBX-5... quand on connait la technicite des TT 1/10e, notamment au niveau de la qualite des materiaux, je suis quand meme tres sceptique. J'attends de voir... il y a pas mal de produits financierement accessibles deja tres performants sur le marche (cyber10B, LRP, MX4,...) je me demande ce que le caster va pouvoir amener. Je garde quand meme un oeil la dessus... j'aime bien les underdogs, mais pas quand on doit lacher EUR100 d'options dessus. Si c'est pas cher, faut que ca marche tel quel, sinon ca n'en vaut pas la peine. ansmann vient de faire la même chose sur son nouveau 4X4, mais la version de base "KIT" sera en stick comme quoi!!!! Caster Racing is pleased to announce their latest entry into the market of RC, the pro version 1/10 scale 4wd buggy. This has been an ongoing project for 3 years and it is finally complete. With new manufacturing techniques and materials, Caster has moved the ball forward into the endzone as an official legitimate player in the industry. Using Delrin gearing, 7075 aluminum cnc machined parts and revised plastic, there is nothing that this buggy compares to on the market today. Due to the fact that Caster Racing is an international company, it will be known as the S10B. In the United States, it will be known as the "sniper 10 buggy" and in our Asian markets it will be known as the "saku 10 buggy". 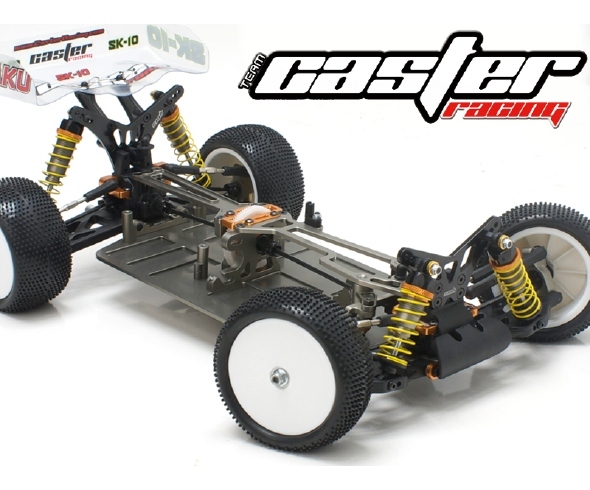 Caster Racing is also releasing a RTR version that is made mostly of plastic parts and will come with either brushed or brushless systems. Pricing to be announced soon, but remember that the company slogan is "The vision of Caster Racing is to make affordable and race competitive rc car kits and parts available to the general public." So if you are considering getting into the 1/10 4wd indoor racing scene this winter, this will be the obvious choice. Pourquoi il manque des vis et des écrous ???? En gros peuvent mieux faire !!!!!!!! Niveau répartition des masses sa se rapproche d'un B44 je trouve. MAIS oui les mecs ces de la pure copie !!! Un mélange entre D4, B44, HPI, et durango pour l'allu !!! De nos jour il faut innover !!!!!!! !